Delighted to announce that Killymuck will be heading to the 2018 Edinburgh festival fringe. There he is seated, in his chair, and the one-hour session may begin. Each question asked digs deeper into Martin’s life: the restless Northern Ireland of his childhood and fleeing to London; the Dance Academy and the smoky night clubs. 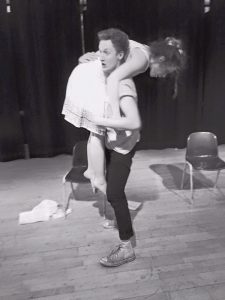 Belfast Boy is a poignant, emotionally charged monologue based on a true story about a professional dancer Martin who has sought the help of a therapist for insomnia. The award-winning actor Declan Perring carries the monologue brilliantly and shows us that creating an inspired, enthralling piece of theatre art only takes one man on stage. Kat Woods’ sensitively nuanced script and Perring’s energetic, utterly committed acting work perfectly together. The thematically huge performance pulls the audience along one memory after another, from joy to sorrow and back again, never once letting go.